Some of you must have seen this picture, where I uploaded it on facebook a few days ago!! And I questioned whether you could tell the difference or not.. Most of them answered correct, NOSE! So what's the secret of getting sharper and taller nose??? the secret lies on this amazing beauty clinic. Ido's Beauty center that's located at Jalan Pluit Indah Raya, No.21, Lt.1, Jakarta Utara, Indonesia 14440 It's across Pluit Village Mal ! And then when its time, you may go inside the consultation room. The doctor that took care of me is named Stella too!! 8D anyway, you will be explained about the treatment and may do the consultation with the doctor here..
Basically this treatment is injecting liquid, that's known as Hyaluronic Acid, an ingredient that's famous for its benefit for skin, and you must have heard about it, because Hada Labo [japanese skincare] is widely known for using this, and its become their main point selling!!! But you can also inject it on other areas, such as cheekbones for high structured face, chin for v-shape, or so on..
And don't worry because the ingredient is very very safe, why not, it is mainly used for skincare! And by all means, I swear that injecting hyaluronic acid doesn't only make my nose taller, but it also makes the area injected smoother and suppler!!! Okayla, no pain no beauty... side effect is that the area might be swollen or become reddish for a few days, other than that nope! Also no need for fasting, and it goes very very fast, only about 15 minutes and you will have a new nose!! Interested? Let's see the treatment! Since I want to have a little longer chin, I asked the doctor to inject a little amount on my chin as well.. The doctor injected little by little to make sure that the shape looks natural..
to make the nose tip sharper as well, the doctor injected a little on the bottom of my nose..
And the doctor massaged my nose so the hyaluronic acid would get nice shape! After 15 minutes, it's done!!! This treatment will make your nose that tall about 1 year! After all, it's not a permanent job, and it's not a plastic surgery, no knife involved so it's very very safe..
And this post wont be completed without before and after picture right???? After all I am super duper happy with this!! Quite expensive eh?? 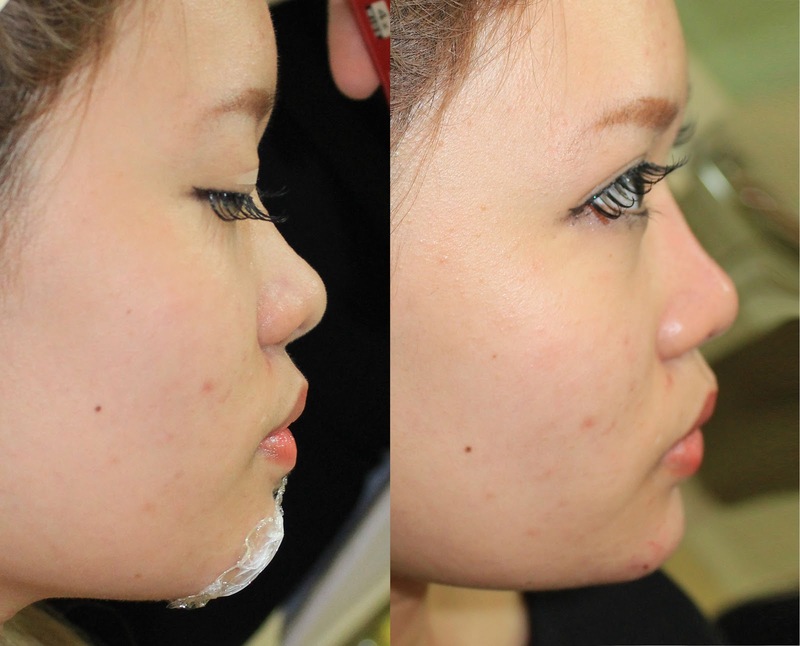 But compared to real nose job, it is much much cheaper, and safer.. But don't worry, right now their clinic is giving away a super big discount for 10 readers of mine!!!! I almost got heart attack when I heard it because it's half price!! 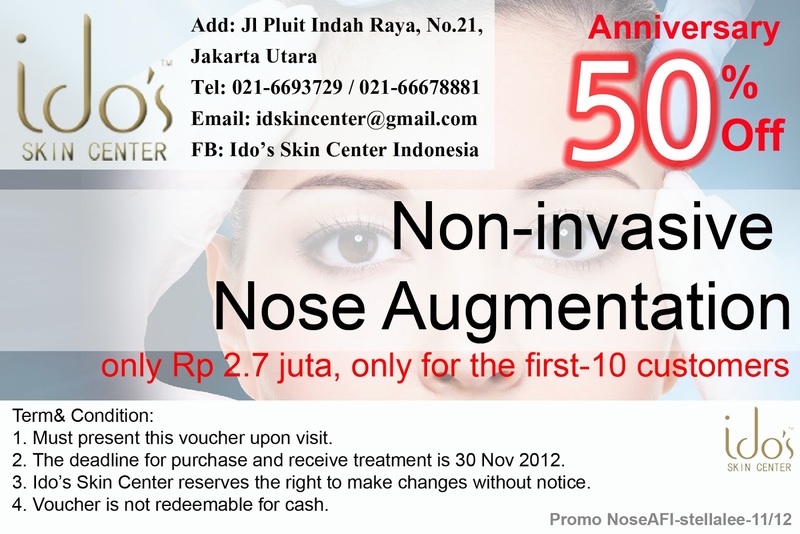 All you have to do is just print this voucher and use it to earn 50% discount for this treatment! The deadline to use this voucher is 30 Nov 2012!! 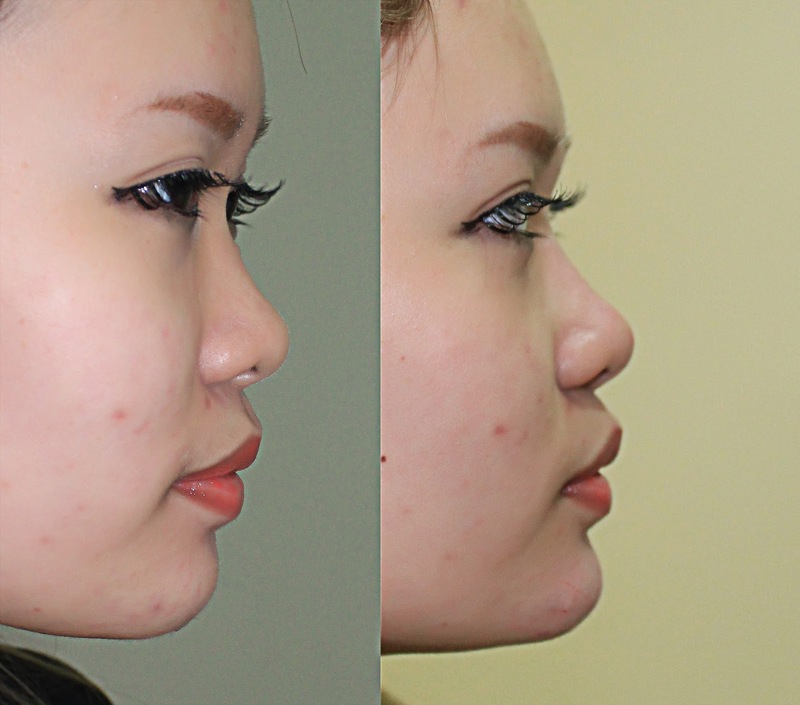 I am not paid to promote this but this is something that's very very worth it and has fair price la.. You get taller nose for 1 year, also can inject the rest to other areas.. Why not?? Ido's Skin Center is located at Jalan Pluit Indah Raya, No.21, Lt.1, Jakarta Utara, Indonesia 14440 It's across Pluit Village Mal. You may come there and get consultation first before deciding with what treatment you should go for. Contact number is 021-6693729 + mail is idskincenter@gmail.com. wih ko bisa gitu sih, keren banget..